UNLV found a way to grind out a 76-67 victory over San Jose State on Wednesday night at the Thomas & Mack Center. On the surface, not a big deal. The Spartans are winless (0-10) in Mountain West play and fell to 3-18 overall. Their wins are over Santa Clara (75-63), Idaho State (62-54) and Antelope Valley (97-45). But for a Runnin’ Rebel team that sputtered to a 2-3 start in conference play, including home losses to Boise State, Utah State and New Mexico, it put Marvin Menzies’ squad over .500 (5-4) at the halfway mark of the conference season and, perhaps more importantly, into fifth place by percentage points over Utah State (6-5) in the Mountain West standings. The difference between fifth and sixth is a big one when Mountain West Tournament play comes around on March 7. Finishing fifth means a bye into Thursday’s quarterfinals. Sixth place means a first round game against the No. 11 seed, likely San Jose State, on Wednesday. For a UNLV team that will need to win the Mountain West Tourney to get to the NCAA Tourney and has questionable depth, winning three games in three days definitely beats trying to win four games in four days. No better evidence of that fact was Wednesday night’s victory over the Spartans. San Jose State may be the worst team in the league but they made the Rebels work for it, trailing by just eight points, 71-63, with 2:38 to go before a Jordan Johnson 3-pointer sealed it. 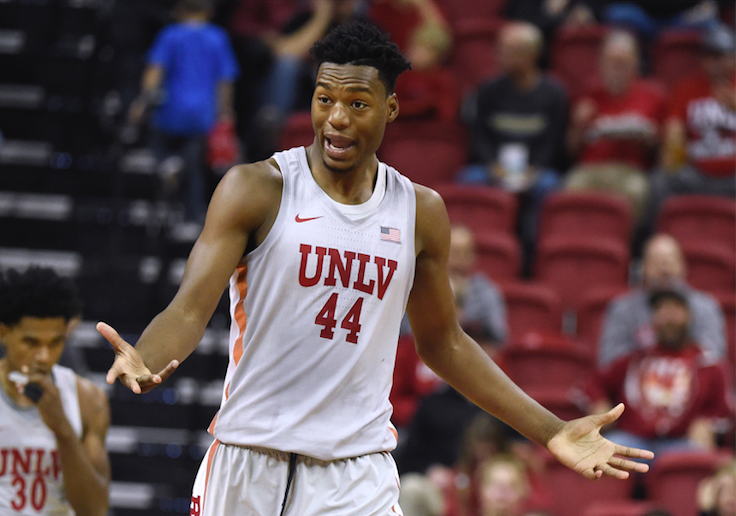 UNLV (16-6) now has won three of its last four games and will take a two-game winning streak and some positive momentum into its toughest stretch of Mountain West play: at Boise State (18-4) on Saturday, at Nevada (19-4) on Wednesday and home against third place Wyoming (15-7) on Feb. 12. KEY PLAYER: Freshman center Brandon McCoy played arguably his best game since his memorable 33-point, 10-rebound showing against potential No. 1 NBA pick Deandre Ayton and Arizona, finishing with 22 points on 8-of-13 shooting, grabbing 17 rebounds and blocking three shots. “The Rebels are coming to town. We embrace that. We want that. We’ve got to get our swag about how we play this game, and I think we need to get a higher level of intensity, passion and enthusiasm when the ball goes up.” – UNLV coach Marvin Menzies. UP NEXT: The Runnin’ Rebels travel to Boise State on Saturday night. The 6 p.m. contest will be televised by CBS Sports Network. The Broncos, who defeated UNLV at the Thomas & Mack Center, 83-74, on Dec. 30, are 12-0 at home this season. NOTABLE: UNLV dominated on the glass, finishing with a 44-24 rebounding edge, 14 offensive boards and a 15-3 edge in second chance points. … The Runnin’ Rebels improved to 19-2 all-time at home against the Spartans and improved to 37-6 all-time in the series. … Forward Shakur Juiston finished just one rebound shy (10 points, nine rebounds) of his tenth double-double of the season. …The Rebels finished with a 10-0 edge in fast break points. … McCoy has 12 double-doubles which ties him for 12th in the nation.